Disc golf review: our local course. 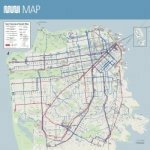 San Francisco disc golf is relatively new. 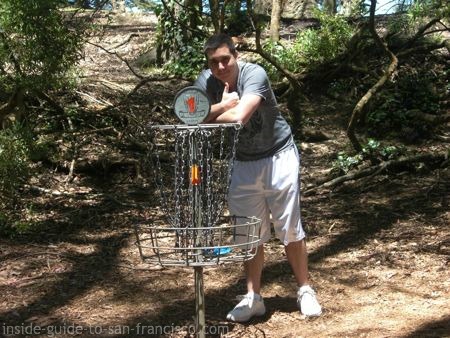 Local volunteers have created a fun and challenging disc golf course in Golden Gate Park. Disc golf is an odd hybrid, golf crossed with frisbee. The course is laid out like a golf course, with players starting at a "tee", then throwing their discs down a long narrow stretch between the trees, and ending with the disc being thrown into a basket at the flag pole. Players keep track of the number of throws they make throughout the game; the lowest score wins. This 18 hole disc golf course was created entirely by volunteers in 2007 and is maintained solely by volunteers as well. I talked to some of the regulars and they told me that it's a very friendly group of people playing here and they welcome newcomers. 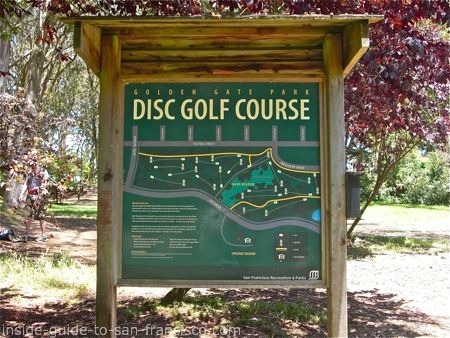 This is the only disc golf course in San Francisco at the moment, but another course has recently been approved for McClaren Park. The woodland setting is delightful. 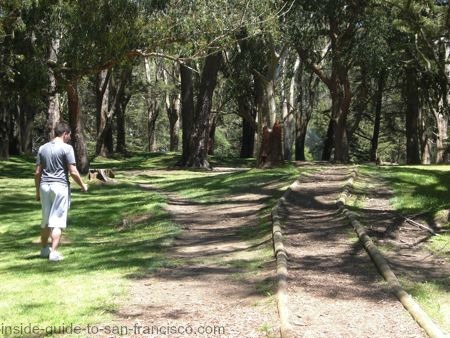 The course winds through the tall forests of Golden Gate Park, which also makes it rather exacting for beginners. If you're a decent frisbee player, disc golf shouldn't be too hard. It is tricky, though, to keep it straight down the fairway; plenty of trees are waiting nearby to snag your disc! For those of us not so hot at frisbee, we spend a lot of time fishing the discs out of the bushes. I think it's a 2-stroke penalty to move your disc back to the fairway. Rats. But it's still a lot of fun. Practical Tip: Bring more than one disc per person; my son lost his disc around the 6th hole, so that was the end of the game! 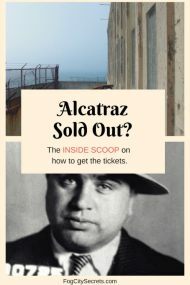 There are no fees! It's always free to play disc golf here. The course is open whenever Golden Gate Park is, which is dawn to dusk every day. The course is closed occasionally for maintenance, usually on the first Saturdays of the month during morning hours, but check their website for more information, www.sfdiscgolf.org. This is a bring-your-own-equipment course. Fortunately, all you need to bring is one or two discs per person. 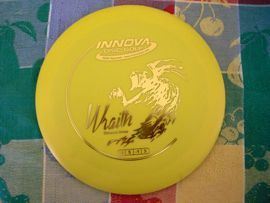 Disc golf has become more popular recently, so the discs are easy to find in most sporting goods stores and run around $8 to $20 each. We got the cheapest ones and they worked just fine. 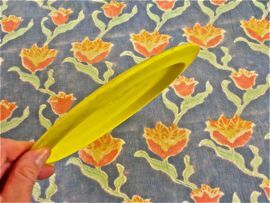 The plastic discs are like frisbees, just a bit thicker and heavier. 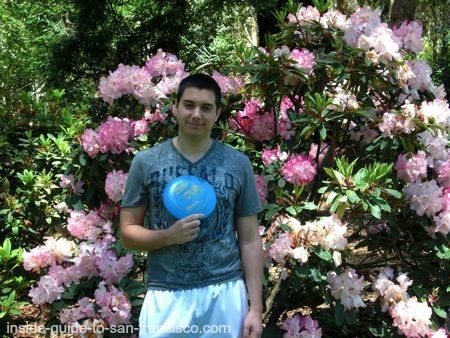 You can download a course map and scorecard from the official website, www.sfdiscgolf.org. This is played a lot like regular golf. Players start at the tee for each hole, then throw their disc towards the "hole", which is a suspended metal basket at the other end of the fairway. You make your next throw from where your disc landed. Golf etiquette applies; the player furthest from the hole throws first. Don't throw if another player ahead of you is within reach of your throw. Remember to shout "Fore!" if it looks like your disc may go astray and get too near another player. There are more details posted at the first tee. 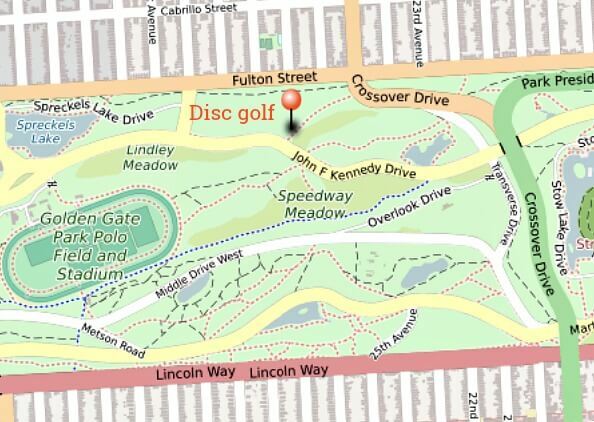 The course runs between JFK Drive and Fulton Street, just east of 30th Avenue in the western half of Golden Gate Park. There is plenty of free parking on JFK Drive, where the course begins at the first tee at Marx Meadow.